This appetizer recipe is an easy way to dress up a fruit and cheese board without serving simple jarred jam and without making your own totally from scratch. 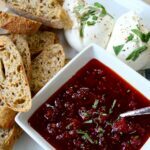 I served this jam alongside fresh Burrata and toasted wheat baguette for a quick and impressive appetizer. It can also be served alongside many different types of cheeses, fruit and crackers. In a small saucepan over medium heat, cook tomato paste, garlic, and onion for about one minute until garlic and onion become fragrant. Add vinegar and whisk to incorporate. Add jam, diced tomatoes, and sun dried tomatoes. Simmer for 30 minutes over medium-low heat, stirring occasionally. Remove from heat, season to taste and top with fresh basil. The jam with be fairly runny so allowing it to slightly cool before serving will help. Recipe Note: Burrata is fresh mozzarella cheese that is stretched to form a bag-like shape; it is then filled with a combination of mozzarella curd and cream. The “bag” is then twisted and closed at the top and dropped in a brine solution. The cream will thicken as it is in the bag. As a result, a rich, smooth center awaits as you cut into the cheese. This is the kind of recipe that you can modify and make your own. Want something a little spicier? Add a pinch of red pepper flakes and chili powder. Looking for a really fresh jam? Stir in lemon zest, parsley and chopped chives before serving. How about a smoky jam; fry up some bacon and save a tablespoon of grease for sautéing garlic and onion. Continue with the recipe, adding in chopped bacon at the end. The great thing about this recipe is that it is quick, easy and really adds to an appetizer course. Because you don’t have to make the actual jam, make sure to use quality ingredients when making this.